Can you believe how excited I was when I found a pile of poo in the garden? So excited I had to take a picture and send it to my friend. She got the excitement immediately. As an animal carer for a hedgehog rescue, having your own hog in the garden is the ultimate reward in life. For two years I have spent time with these gorgeous creatures. Caring for the very young and those who are in their final days either from old age, illness or injury. It takes me back to my childhood when I hand reared a nest of hoglets that were on the side of the road close to the remains of their mother. Little did I realise that 35 years later I would be caring for this species again. Times have changed and Hedgehog Rescue Centres are now the best place for any injured or orphaned hogs. The European hedgehog (Erinaceus europaeus) is native to the UK and can be found across the countryside living in urban as well as rural locations. They favour parks and gardens for the profusion of slugs, beetles and worms that they can forage for during dusk with hideaways to get warm and cosy during daylight hours. They live for a maximum of about 7 years, becoming more russet in colour as they age. They have about 7000 spines which are full of nerve endings. When the hog feels threatened they will curl into a tight ball. A response that develops as they mature. Even a gentle brush of the spines will result in a ripple of muscle tension as the nerve endings in each prickle are stimulated. It is much easier to say what is normal! If your hedgehog is doing this then they are probably fine. If you find a nest with a sleeping hog, leave it alone unless they are in immediate danger from man-made or environmental changes such as impatient builders or flood water. They are not choosy where they make their nest. If you find them in a garage or shed and they can get in and out then leave them alone. Hedgehogs are nocturnal and will come out as the sun goes down. You will often hear them snuffling around after dark. Young hungry hogs may emerge early or stay out late in the morning and appear to be on a distinct mission to find food like any hungry teenager. Unless they are staggering or sleeping in the open then they are probably okay. 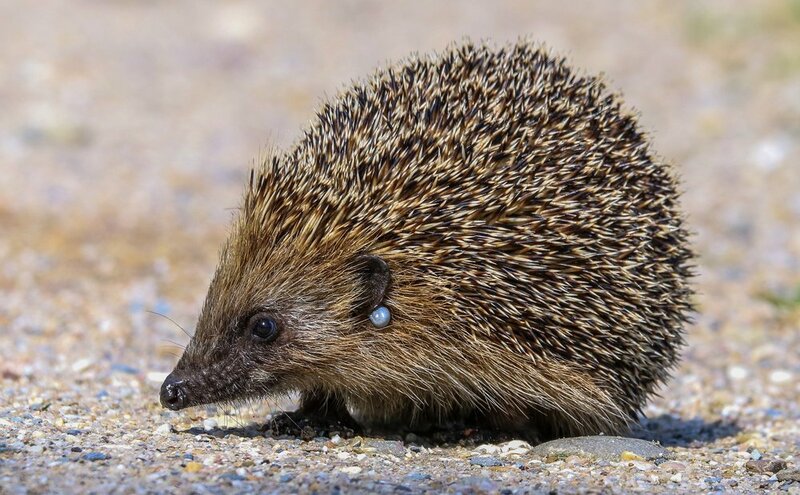 A hedgehog out is daylight is not a good sign - however a female may ‘nip’ out during daylight hours to escape her demanding young or collect nesting materials. If the hog is on a mission watch from a distance and see what she does. If you find a nest of hoglets, leave them well alone and observe from a distance. Mum may return, but if they are still alone after an extended period or you know that mum has been killed or injured then seek advice. Whilst hedgehogs hibernate, this is not a fixed period over winter and if the weather warms up some may come out to feed. If you feed your resident hogs then continue to put fresh food and water out over the winter months. If a large hedgehog is out in the winter months and is behaving normally then leave it alone, it will hibernate when it is good and ready. Hedgehogs under 650g (small melon size) may need help to get through the winter so again seek advice. Some hedgehogs are perfectly healthy but may have small ticks. If they are distressed or unwell then seek advice but a tick is a normal visitor for a hedgehog. Hedgehogs are wild animals and unless they are unwell or injured should be left to fend for themselves. Support feeding especially in very hot or very cold weather can help them immensely. The wild hedgehog diet consists of worms, bugs, slugs, birds eggs and similar meaty treats. They are best fed dry and wet cat food without any fish in the ingredients if you wish to support them. There is also hedgehog food available online and from pet shops which is really good for them if a little more expensive than cat or dog food. Feeding should be accompanied by fresh water each day. To prevent local cats helping themselves putting the food inside a box with a small hog sized opening should allow them to feed without having to share with the local feline squad. Providing a quiet corner in your garden with a hedgehog house will give them a safe space to nest. Leaving hay or shredded newspaper in an upturned container will allow them to build the nest to suit their requirements. Some are very industrious and will drag all sorts into their nests whilst others will be content with very little. Keeping dogs away from them is essential. The dog will come off as badly as the hog if they have an encounter - bite wounds in the hog and prickles in the dog. Never a good combination. Removing the hog from your garden is not going to help. If the hog is removed others in the area will move in. It is better to let the dog out under supervision in the dark if you suspect you have a little visitor. Before strimming or lighting a bonfire always check for hedgehogs under leaves and logs. They will be hidden away and some of the worst injuries that I have seen are caused by accidental strimmer encounters. If you find a hedgehog that is very small and out in the day or looks injured then carefully pick it up using gardening gloves or a towel. An adult hedgehog is about the size of a small melon. Any hogs that are the size of a grapefruit or smaller and are out in the day or during the winter months really need to be seen by a professional. If you find or disturb a nest with hoglets leave it alone incase mum returns and seek advice before moving them. Pop the hedgehog into a high sided box (they are good climbers) or a cat basket with a towel to make a small nest and provide water. Make sure they are not on their back as they may struggle to uncurl and turn over. A small hot water bottle wrapped in a towel is also a good idea to keep the temperature up even if it is warm weather. Just make sure there is space for the hedgehog to get off the heat if it wants to. Don’t leave a cold bottle in with the hedgehog as this will cause more harm by cooling it too much. Once you have it contained then contact your nearest hedgehog rescue. They will give you advice and usually ask you to bring it in or arrange collection so it can be assessed. Most of all, enjoy having YOUR hedgehog in your garden. It is a privilege to have these endangered creatures choosing to make your garden their home and at the same time help to keep your slug population under control. All of these images are free stock images from Unsplash and Pixabay as I am yet to photograph any hogs that aren’t guests at Prickles!